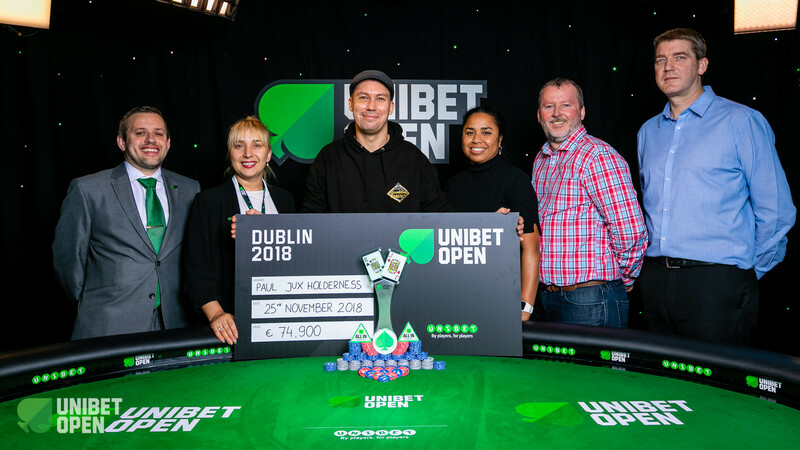 The 2018 Unibet Open Dublin €1,100 Main Event champion has been crowned and it was UK’s Paul Jux Holderness that lifted the check and trophy for winner shots at the Bonnington Hotel in Dublin. Jux Holderness already finished 3rd in the €2,200 High Roller and the 34-year-old from Bournemouth defeated Frenchman Julien Kron in heads-up to claim the top prize of €74,900, capping off a very successful trip to the Irish capital. Despite starting into the heads-up against Kron with a slight chip deficit and falling back further beyond very quickly, Jux Holderness admitted that he never felt nervous at all on the live stream table. A gutsy bluff with just six-high changed the momentum of the duel entirely and not even half an hour later it was all over when Kron got it in drawing dead. The event easily surpassed the guaranteed prize pool of €250,000 and a total of 359 entries emerged, the top 47 spots took home a portion of the €359,000 prize pool. 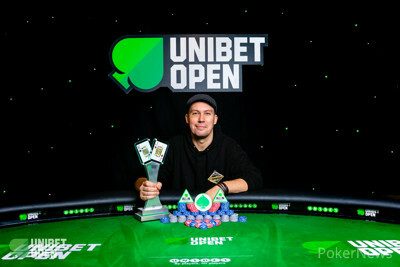 The 2014 Irish Open champion Patrick Clarke became the first casualty on the final day and Pot-Limit Omaha expert Henri Koivisto finished in 7th place, Irish poker legend Mick McCloskey had to settle for 4th place. Only 11 players returned for the final day of the Main Event and it would take until the end of the second level of the day to lose the first player. Ultimately, it was Patrick Clarke who ran with pocket fours into the pocket aces of Mick McCloskey over on the feature table. Moments later the final table was all but set and Keith Brennan was left with two outs on the flop against Henri Koivisto. Instead, the miracle comeback of Brennan from 1 big blind and one ante via triple up and two double ups continued. Well-known local player Robbie McCormack then missed out on the final table in dramatic fashion after his superior flush draw against Michael Brock ended up second-best. The final table itself was a topsy-turvy affair with dozens of double ups. Joseph Ellis and Jakub Groblewski departed in quick fashion, and Henri Koivisto ended up in 7th place. Start-of-the-day chip leader Michael Brock went from chip leader to out in 6th place in half an hour and a big flip with ace-king versus queens ran out in favor of eventual champion Paul Jux Holderness. Seemingly all the short stacks doubled when at risk and it was Mick McCloskey that first doubled Keith Brennan before bowing out to his fellow countryman. However, the fortune of Brennan changed in dramatic fashion just a few minutes later when the Irishman faced the all-ins of David Schable and Julien Kron. Brennan called with pocket queens, Schable held ace-queen suited and Kron turned over pocket jacks. Right away, a jack appeared in the window and the heads-up between Kron and Jux Holderness was set up. The early momentum belonged to Kron, who established an almost 3-1 lead, but Jux Holderness struck back in impressive fashion with a successful six-high bluff. From there on, the Brit pulled into a comfortable lead and sealed the victory within half an hour. Kron defended his big blind with jack-eight and flopped top pair, but when the chips went in on the turn, Jux Holderness had locked it up with king-jack for top two pair and even rivered a full house for good measure. In the €2,200 High Roller, Benny Glaser overcame eventual Main Event champion Jux Holderness, among others, and lifted the trophy on his first ever trip to Ireland. The esports crew had reason to celebrate as World of Warcraft player Kelvin “Snutz” Nguyen won the Flipout Event. 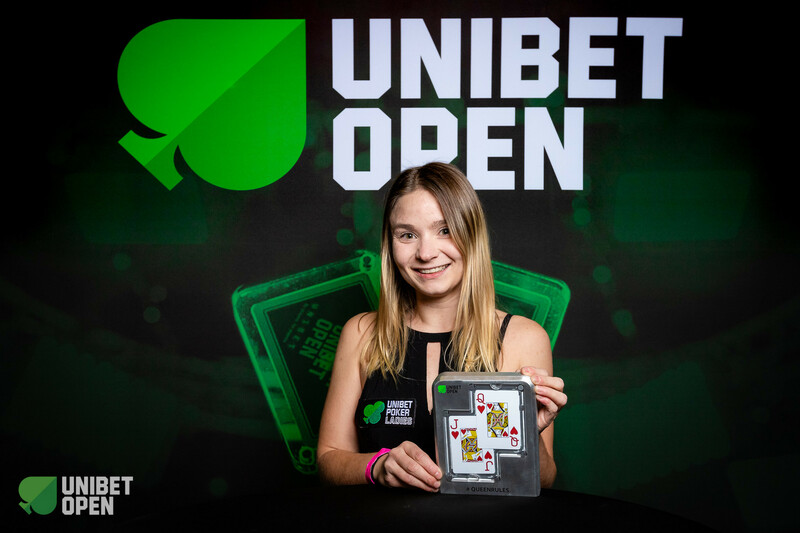 The €80+10 Queen Rules Ladies Event, hosted by Daiva Byrne, surpassed the expectations with a field of 46 entries and Emelie Svenningsson was all smiles after a lengthy and fierce heads-up battle. One of the last Side Events to award a trophy to the champion was the two-day Superstack with a buy-in of €330, which attracted a field of 94 entries. Eight Irish players and one Norwegian ended up on the final table and it was Feargus Murphy who overcame a 1-5 chip deficit and claimed the trophy. Murphy was railed by his good friend and 2018 WSOP Europe Main Event champion Jack Sinclair. The final event of the festival was a €100+10 Hyperturbo and it ended in a three-way deal. Right when the last hand of the Main Event appeared on the livestream, Alan “hotted89” Widmann appeared in the commentator box and spread the news of his victory. That wraps up the PokerNews live reporting here from Dublin and also the 11th season of the popular mid-stakes tour. Online satellites for the next stop in Sinaia, Romania, are already running on Unibet Poker.